I updated my local copy of the Github repository for Plone buildout.coredev and gave the branch for the Python 3 migration another try. I run the bootstrap-py3.sh script and all packages were updated. Then I started Plone with ‘./bin/wsgi fg’ and created a new Plone site. I activated the multilingual add-on to make the new Plone site available in different languages. This added a special dialog to the administration page. I opened this dialog and added a second language to the site (in my case German). Plone created different folders for each of the two languages. I gave first the English folder a try and added a first page to it. 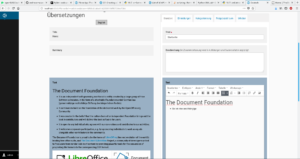 Because I don’t want to use my time for typing I copied content from the website of The Document Foundation website. I published this page and choose it as the default page of the English section. Then I tried out the translation framework of Plone. I made a test with a translation of the page into German. The dialog shows me the different fields of the English page and I could easily start to write a translation into German. If I had already local or somewhere else a translation of the English text, I could do copy and paste. Once finished with the translation I saved it and published the page. I set it as the default of the German section. Users with German laguage setting or preference will get this translated page as their entry point now. Zurück Vorheriger Beitrag: Fake News About Expense?